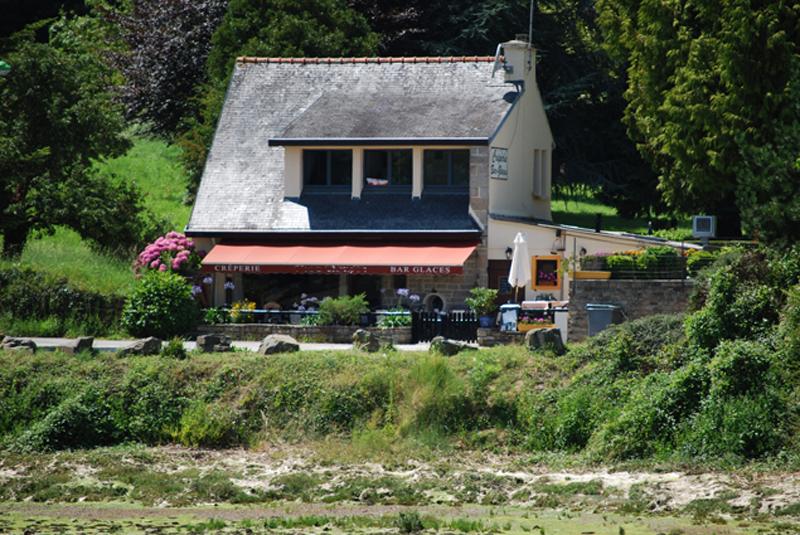 This gorgeous establishment is La Crêperie Quartier D’été in La Forêt Fouesenant where I went for lunch on Saturday. Chris and I went there in 2011 and I traced it from the photograph of a chalk-board menu amongst our holiday snaps. I didn’t actually get lunch because it was full. “Pardon, nous sommes complet,” said the Patron. No matter, I reserved a table for dinner at 7.30pm instead and drove off to find somewhere to walk with Teddy, and for me to have a cup of tea and read. We ended up by the ruins of the Abbaye Saint Maurice, next to a large wooded lake and let the afternoon drift by. Cometh the hour, cometh the man. 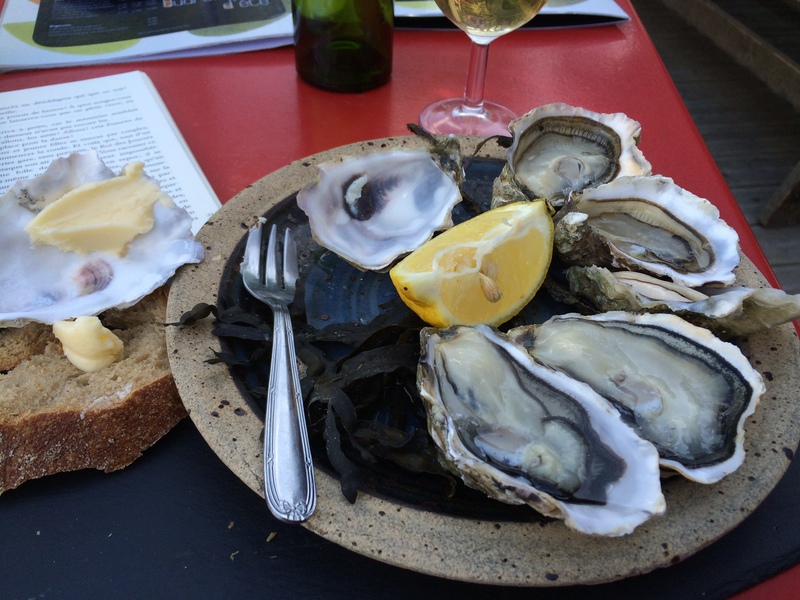 Seated on the terrace at 7.25pm, I ordered a small carafe of house white and six oysters. To say that they were merveilleux would be doing them an injustice… they were exquisite . 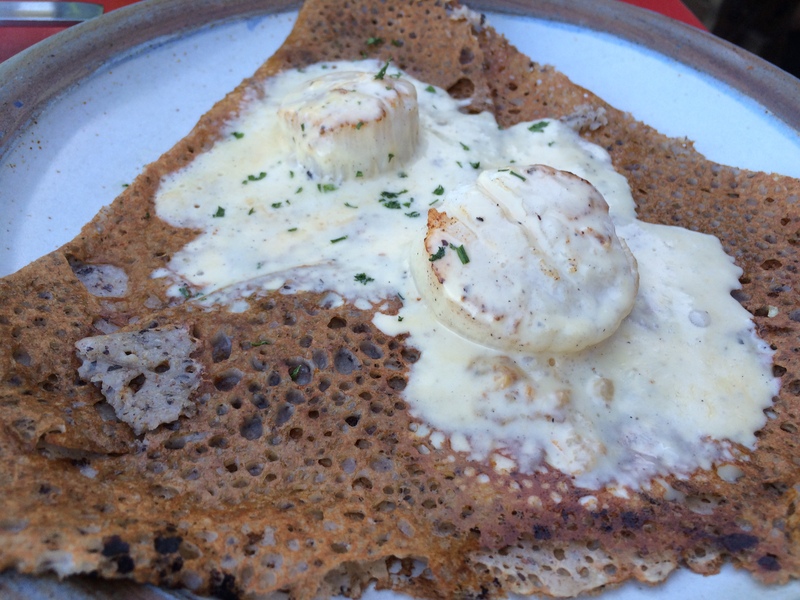 Now for the main course: a buckwheat galette with scallops in a white sauce involving Lambig (a Breton liqueur distilled from local hard cider). For desert: a sweet crêpe with caramel sauce and apple (sadly, no picture as I was too greedy and forgot) followed by a large espresso. I know Chris would have relished every mouthful. I chose exactly the same items for each course that we had enjoyed together. The meal was a sort of gustatory homage to our shared love of good food and the delights of travelling in France. Afterward, I spoke to the Patron and told him about the visit Chris and I had made before and how much it meant to me to be back there, now that she has died. I tried to explain in broken French how the evening had been parfait but that without her nothing is complet.